White paper on crime 2001 Part 2/Chap.5/Sec.2/2. Fig. II-15 shows the trends in the number of inmates whose parole applications were received since 1981 (see Appendix II-11 ). The number of parole applications received had been steady at around 13,000 since 1992, but started to increase in 1996. It reached 14,179 in 1999, surpassing the 14,000 mark, and then increased by 3.1% from the previous year to 14,625 in 2000. In recent years, no applications have been received for provisional release of penal detainees or workhouse detainees, or provisional discharge of women in women's guidance homes, with the sole exception of one detainee granted provisional release in 2000. Fig. II-16 shows the trends in the number of parolees and parole rates since 1981. In 2000,the number of parolees was 13,256, the same as that of the previous year. The parole rate has been over 56% since 1989, but it decreased to 55.9% in 2000, down by 1.4 points from the previous year. Table II-21 shows rates of rejection of parole applications over the last three years with respect to sentences other than indeterminate sentence, by term of sentence. Fig. II-17 shows rates of the completed term of execution of the sentence (percentage of the original sentence actually served until release on parole)for inmates granted parole in 2000 (except inmates serving indeterminate or life sentence), by recidivist/non-recidivist and term of sentence. 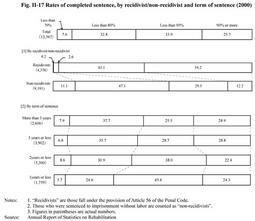 In the comparison between recidivists and non-recidivists, the rate of the completed term of execution of the sentence is lower for the latter. Table II-22 shows the number of inmates serving life sentences who were granted parole over the last ten years, by length of stay in penal institutions. In order to help offenders in correctional institutions make a smooth return to society, probation offices carry out environmental adjustment. This involves continuously coordinating with family members and other guarantors as soon as the offender's custody starts, and preparing the environment most conducive to the offender's return to society.